Published: March 19, 2019 at 08:48 p.m.
Scouts and coaches of NFL teams gather in State College, Pa. to see the best Penn State football has to offer. 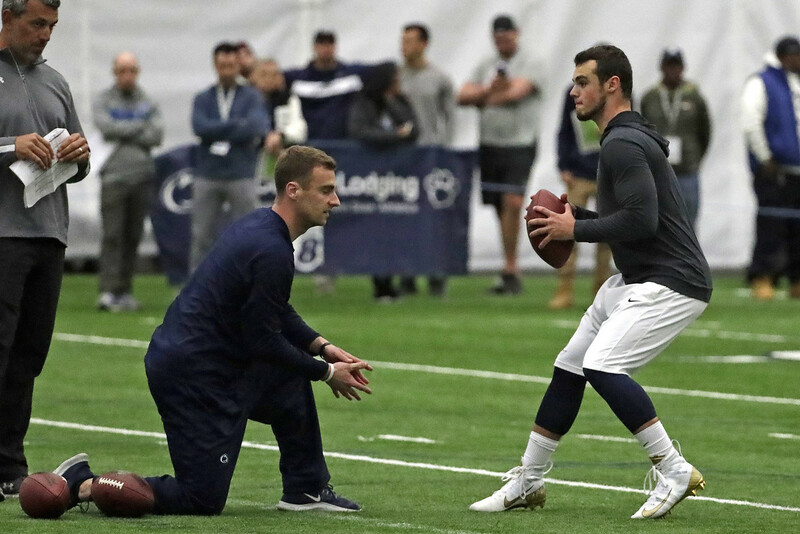 With nearly a month away until the 2019 NFL draft, take a look at some of the best moments of the 2019 Penn State Pro Day. Penn State quarterback Trace McSorley runs a drill during Penn State's Pro Day in State College, Pa., Tuesday, March 19, 2019. Penn State defensive tackle Kevin Givens runs a drill during Penn State's Pro Day in State College, Pa., Tuesday, March 19, 2019. Former Penn State running back, now with the New York Giants, Saquon Barkley, center, hugs Penn State quarterback Trace McSorley, right, after his workout during Penn State's Pro Day in State College, Pa., Tuesday, March 19, 2019. Penn State offensive linemen Connor McGovern, left, and Ryan Bates run a drill during Penn State's Pro Day in State College, Pa., Tuesday, March 19, 2019. Penn State defensive end Shareef Miller runs a drill during Penn State's Pro Day in State College, Pa., Tuesday, March 19, 2019. Penn State cornerback Amani Oruwariye talks with reporters after working out at Penn State's NFL Pro Day in State College, Pa., Tuesday, March 19, 2019.